The beam will be split into 192 beams, using a massive “super-laser”, which is equal to 3 football fields in size. These beams will all be aimed at one point, which is only about the size of a BB. Before this is to take place, the ‘BB’ point will be covered in tritium and deuterium, which are 2 reactive hydrogen isotopes to be taken out of seawater. A gold capsule is then used to surround the target. When the laser is fired, the result is that it will create a temperature hotter than the sun’s center! How much energy do you think that could generate? We’ve all heard of wind, solar, and biomass, but can there be new alternative energy sources on the horizon? You bet there can! Two amazing new forms of alternative energy are currently being developed, and here are brief explanations of what they are. This is probably one of the most extreme forms of alternative energy. It is believed to be a permanent solution to our planet’s energy shortages. Scientists are out to perform a very intense nuclear reaction – one that will actually create a star right on the Earth’s surface. This group of scientists is aiming to have the “star” harnessing energy as early as late summer 2011and resolve the global energy crisis once and for all. 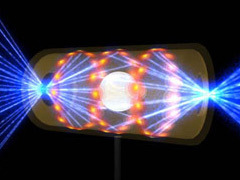 The method that will be used to harness this energy is nuclear fusion, which is considered to be a miracle power source by the scientific community. Posted on June 6th under Energy of Stars.